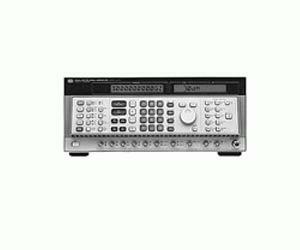 The Agilent 8780A vector signal generator is a synthesized IF source with exceptional modulation for modern receiver and component testing. It is capable of modulation bandwidths almost 100 times wider than previous synthesizers. It has built-in mapping to simplify generation of common digital modulation formats. Its extra-wide modulation bandwidth comes from a vector modulator that effectively doubles baseband modulation bandwidths for 700 MHz of output modulation. The vector signal generator''''' wideband modulation is complemented with an unmodulated coherent carrier output for demodulation of test signals. The Agilent 8780A vector signal generator offers a wide variety of modulation using both digital and analog inputs. It generates many standard digital modulation formats like QPSK and 16 QAM and traditional modulation like FM, AM, and pulse. By combining the different modulation types, signals as diverse as Barker-coded radar pulses and Doppler-shifted satellite signals can be simulated. The Agilent 8780A vector signal generator is well suited for receiver measurements where wideband or complex modulations are required. It can be used as a calibrated transmitter to test modern radar EW receivers or communication receivers using vector I/Q modulation techniques. It provides a stable, coherent carrier for pulse measurement. It can also be upconverted if receivers operate at frequencies higher than 3 GHz.